Sir Frank Williams had just begun his post-race pep talk. Many of the WilliamsF1 team members were crouched around him, craning to hear his words. He spoke of the effort they had been making over the past months, of the improvements brought by the technical team…. We don’t yet know the detailed cause of the explosion. It was fuel-related; that seems to be clear. Many suspect that there was also a KERS element. Hopefully we will know soon. What is clear is that F1 again showed its grit under pressure. Dr Mark Gillan, Williams’ Chief Operations Engineer, grabbed Frank and moved him swiftly towards safety. Mike Coughlin, Technical Director, was soon on his hands and knees, scouring the garage for anyone possibly in danger, seemingly oblivious to the toxic smoke and flames. And F1’s mechanics – from all teams, including Williams – were exemplary. Local fire-fighting crews had begun to pack up; the race was over. 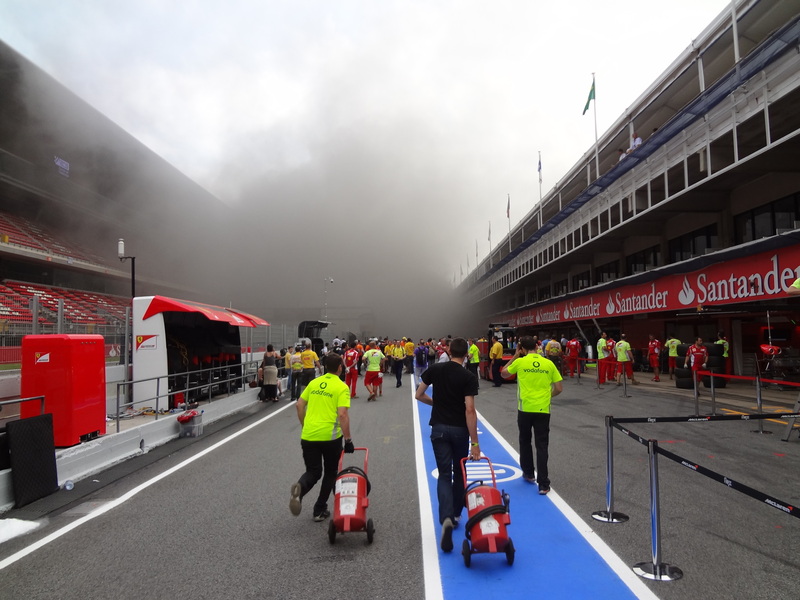 As Diego Merino’s picture shows, mechanics grabbed fire extinguishers and ran to the scene from all directions. These two – James Prosser (tyre man) and Lee Hart (Lewis Hamilton’s car) are from McLaren. Exposed personnel were cared-for in F1 motorhomes – at Red Bull and Force India; thankfully, as of this writing, there appear to be no critical injuries. For WilliamsF1, though, the damage has been immense. Bruno Senna’s car – in the garage following its shunt with Michael Schumacher’s Mercedes – has been severely damaged. All of the major computer and garage equipment has been destroyed. Many Williams team people are still in Barcelona, surveying the damage and drawing up contingency plans for Monaco. There are even a few whispers that the team may not be able to race at the Principality. I doubt that. If necessary, I believe that the other F1 teams will come to Williams’ aid. It is a part of what they do. An unfortunate end to a fantastic day, I’m glad to hear that there were no serious injuries. Also a massive thanks should go out to all F1 personnel who assisted and stopped it getting any worse. As far as the race was concerned, I’ve always been proud to be a Williams fan but yesterday was immense, 2nd only to 14th July 1979. It was a proper race win, not a middle of the grid team benefitting from a front-runners mishap but a proper race win, so proud of the guys from Grove. well done all. What an emotional day Peter!Was absolutely thrilled for Sir Frank and the Williams team.Couldn’t believe it!Do you think this will have any health & safety repercusions?I wasn’t surprised that everybody rallied round.The F1 family will always be a close one no matter what. Thanks for the insight Peter, a truly scary occasion for all involved. It had been an amazing day for Williams F1, and it was great to see Sir Frank at the circuit for this great moment, just sad to hear what followed. I do hope they will race in Monaco – but either why I know that all the teams will rally around to help. Yeah, they say IT equipment is pretty much gone… We all know how F1 garages are stuffed with all types of things, be it mechanical parts or team gear, etc., they do carry around plenty of racing material. Williams will bounce back from this. Forza guys!!! I’m sure Williams will be racing, and racing well, in Monaco. They’re an unbelievably resilient team. It’s fantastic to have confirmed again the cameraderie and courage imbuing the F1 paddock, but a shame that Williams’ moment of glory was ruined. I agree with you entirely ‘bootneckuk’ about Sunday, the race and the events that followed… As ever PDW’s insight is brilliant! And, I couldn’t agree with you more either about 14th July 1979, as I was there too at Silverstone to see Regga’s victory – a deserved first win for Williams GPE. It is great to hear that ex-Williams personnel at McLaren are already rallying around to help before Monaco begins in 10 days’ time!